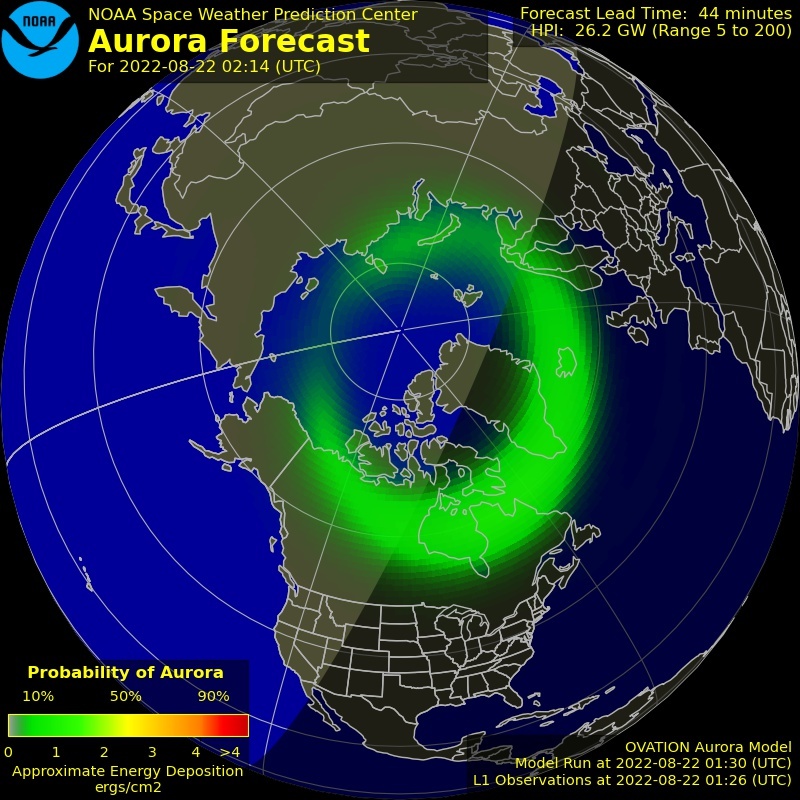 When you see the predictive band of the Ovation Prime Model turn bright green, yellow, or better yet red, it means the odds of Aurora activity are very high. This is best used as a short term forecasting tool. NOAA puts out the very best 27-day forecast. Any forecast more than three days out suffers severely in inaccuracy but if you are making long term plans and want a little help, check it out. It is made in UTC time which is 9 hours off from Alaska. This, and the fact that we care about night time solar winds, which straddle two calendar days, leads to the forecasts often being late by a day for Alaska. You should consider a 2 to be average to slightly below average and a 3 to be average to above average. Twos and threes are the most common predictions. Look for several days in a row with 3's and 4's or higher for best results. 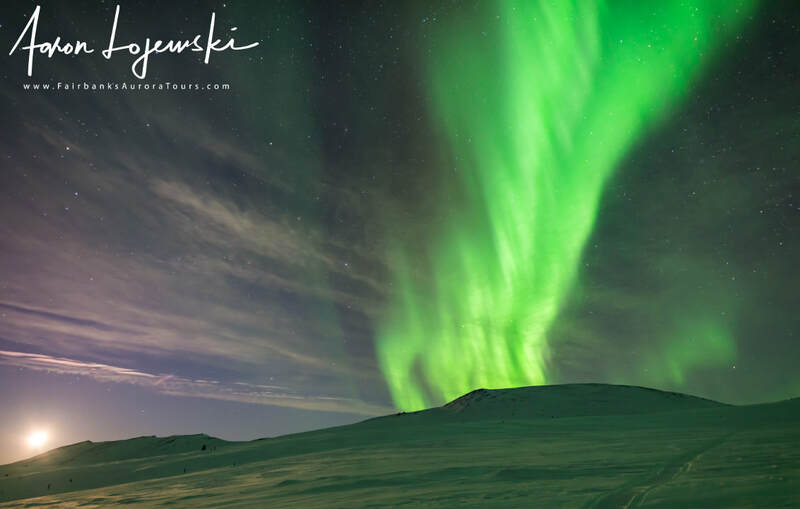 The northern lights can be seen regardless of the moon's phase on an active night. It can be helpful for there to be some moon because the partial moon will light up the landscape for your pictures. Strictly speaking, for viewing purposes only and not photography, it is better to have less moonlight than more. 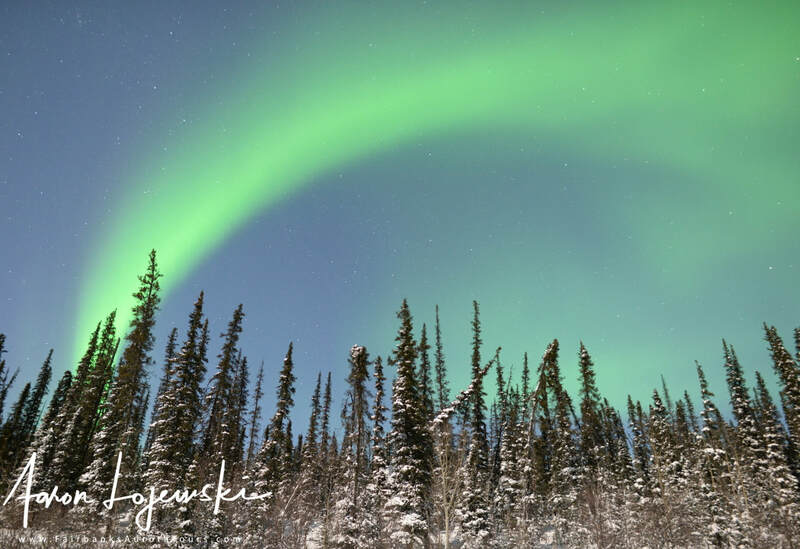 Too much moonlight can make it difficult to see quiet aurora displays with the naked eye. Our tours often get sold out near a new-moon so it is wise to reserve your spot on it as soon as you know you will be traveling. You can check the moon phase, moon rise times, and moon set times for Fairbanks, Alaska at www.timeanddate.com linked here. You can see here that the landscape is very bright, this makes it difficult to see the stars in the photo (they are there) and makes it difficult to do long exposures on the camera because the landscape would be too bright. You can actually see the half-moon as it is setting in this photo. 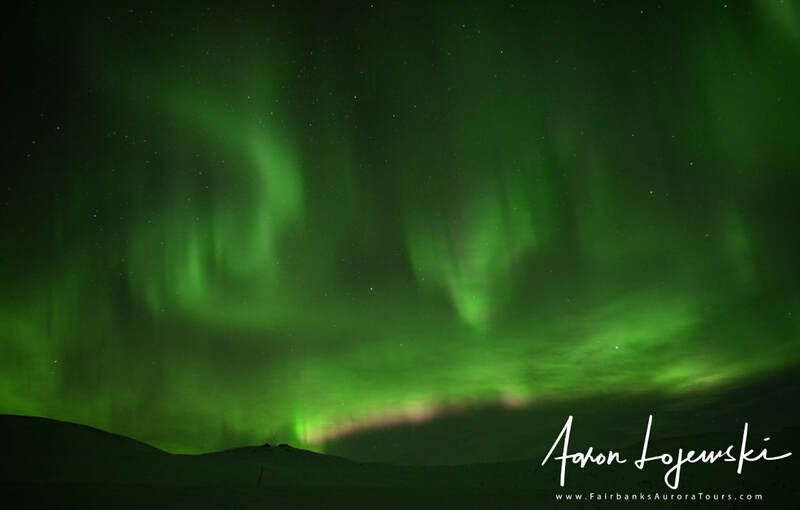 It really nicely lights up the mountainside and moments later it set leaving the landscape in darkness. Pro tip: having a near half moon that sets between 11 pm and 1 am can give you the best of both worlds, moonlight and no moonlight in the same tour. This photo was taken on the same tour and only minutes after the half-moon photo. It is equivalent to a new-moon situation. Notice just how dark the ridgeline and mountains are. That saddle you can see in the ridge line on the left is the same one seen in the half-moon picture except in that photo it is on the far right.